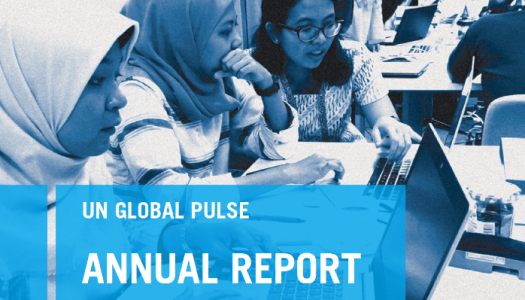 Demand for UN Global Pulse’s expertise increased in 2018 with partners wanting to collaborate on innovation projects and tools, policy exploration, data protection and privacy frameworks, and public awareness raising. UN Global Pulse continued to be uniquely positioned to help UN partners explore the potential of big data and artificial intelligence for sustainable development, humanitarian action, and peace. The 2018 Annual Report summarizes exploratory research conducted by the Pulse Labs and presents solutions that were mainstreamed with partners. It details efforts to adopt the first UN Principles for Personal Data Protection and Privacy, and showcases Global Pulse’s contributions to develop standards and national strategies for the ethical and privacy protective use of big data and artificial intelligence. Finally, the report highlights Global Pulse’s engagement with the data innovation ecosystem through capacity building, collaborative research, and responsible data partnerships.